Waitrose Farmhouse Dorset Lamb comes from an old English breed of sheep that produces its young in autumn rather than spring, providing flavoursome, succulent lamb much earlier in the season. It makes the perfect choice for a family roast. Preheat the oven to 180°C, gas mark 4. To make the herb crust, remove and discard any thick stalks from the watercress, mint and parsley and place in a food processor with the garlic. Pulse until roughly chopped. Keeping the machine running, pour in the olive oil to make a paste. Season to taste. Arrange the potatoes in the bottom of a roasting tin and place the lamb on a rack over them. Spread the paste over the lamb. Roast the lamb in the oven allowing 55-65 minutes per kg, plus an extra 25-30 minutes. Stir the potatoes occasionally during cooking. When the lamb is cooked, remove from the oven, cover with foil, keep warm and allow to rest for 10 minutes before carving. This allows the meat to relax, to produce a more tender cut. If the potatoes are not quite cooked, return to the oven for 10 minutes or until tender. 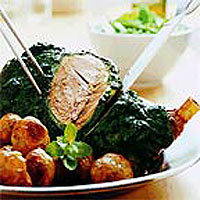 Serve the lamb with the roasted new potatoes and steamed green vegetables. To test how well the lamb is cooked, insert a skewer or carving fork into the centre of the flesh, remove it and allow the juices to run - the pinker the juice, the rarer the meat. Add the rind and juice of half a lemon to the herb crust. You could also use different herbs such as thyme and rosemary. This recipe was first published in April 2002.